Our Super Dewatering Press™ can dewater a synthetic rubber crumb from 60% inlet to a discharge moisture as low as a 3-5% range with one machine. The discharge material is cut into a porous pellet form that can be easily dried in a hot air type dryer. Compared to a regular dewatering screw press at 12% discharge moisture, the Super Dewatering Press can allow you to use a smaller size conveyor dryer with potential energy savings. Compared to a mechanical drying line and the higher temperatures required, the Super Dewatering Press will have a lower temperature and eliminate the quality problem for temperature sensitive materials. 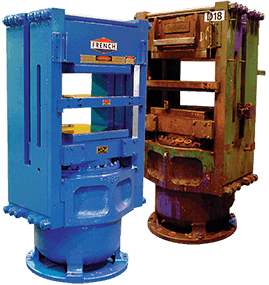 Sizes are available for capacities from 1 tons/hr to over 12 tons/hr. Visit our literature page to download a brochure for the French Super Dewatering Press.